One thing led to another while searching for something or other on the Internet and I got caught up searching YouTube for femulations on the Your Face Sounds Familiar television show in all of its international versions. I was surprised how many femulations I found. Since the femulators are being made-up, coiffed and dressed by professionals, most of the femulators look very good. But when they open their mouths, it is usually incongruous because most of them choose to sing in their male voice. On the other hand, a few attempt to sing in a female voice and those who have pulled it off have been appearing in the Femulator slot below this week. One of the more unique femulations I have found features a femulation of a femulator femulating Mae West! Back in 1937, Polish film Piętro Wyżej (On the Floor Above) featured actor Eugeniusz Bodo femulating Mae West. Almost 80 years later, Polish singer Bartek Kasprzykowski recreated Bodo's femulation of Mae West on the Polish version of Your Face Sound Familiar, Twoja Twarz Brzmi Znajomo. YouTube has both and you can view them below. If you don't understand Polish, you might want to fast-forward to the 58:50 mark of the film to catch Bodo's femulation. 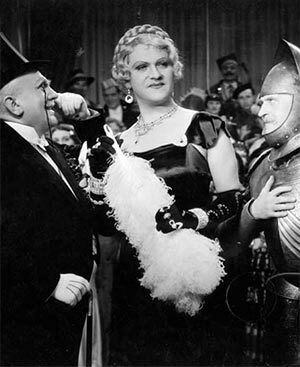 Eugeniusz Bodo femulates Mae West in the 1937 film Piętro Wyżej (On the Floor Above).